The MHC class I-like CD1d glycoprotein is a member of the CD1 family of Ag-presenting molecules and is responsible for the selection of NKT cells. A number of ligands that can be presented by CD1d to NKT or other CD1d-restricted T cells have been identified. 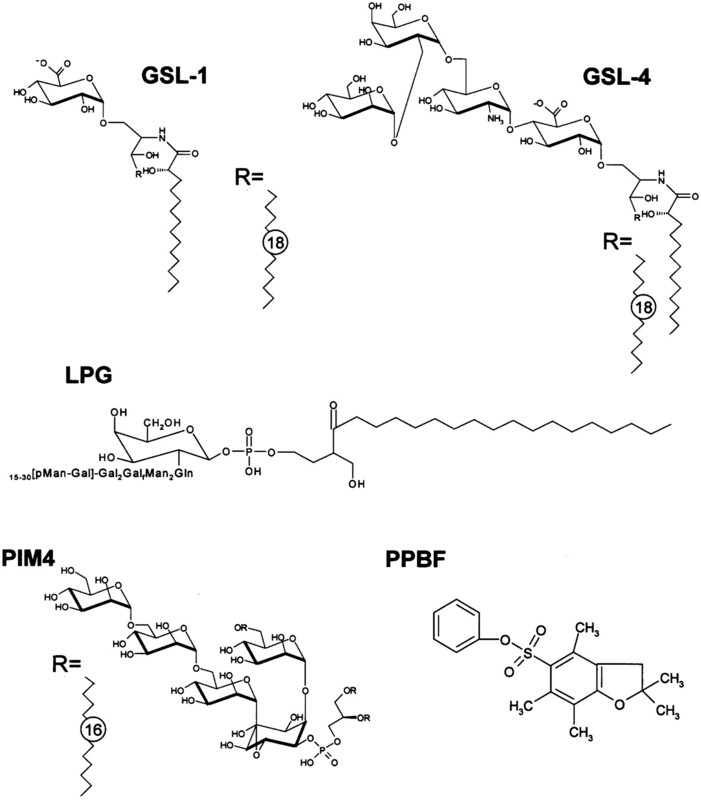 These include glycolipids from a marine sponge, bacterial glycolipids, normal endogenous glycolipids, tumor-derived phospholipids and glycolipids, and nonlipidic molecules. The presentation of many of these molecules can have immunopotentiating effects, such as serving as an adjuvant against malaria or resulting in a more rapid clearance of certain virus infections. They can also be protective in autoimmune diseases or cancer or can be deleterious. This review will highlight these ligands in a discussion of their potential use against (and role in the pathogenesis of) these diseases. It is said that looks are not everything. Nonetheless, how things look (i.e., structure) can have profound effects on biological functions. The folding and overall structure of MHC class I and class I-like molecules possessing activities ranging from Ag presentation (1) to the transport of maternal Abs via a neonatal FcR (2, 3, 4) to iron transport (5), demonstrate that this particular “look” goes a long way, and is thus critical. The majority of these molecules are involved in Ag presentation. In addition to the MHC class I and class II Ag presentation pathways, the presentation of nonpeptidic ligands (almost all are lipids) occurs by CD1 molecules. The CD1 family consists of two groups based on amino acid homology (6): group 1 includes CD1a, b, and c, whereas CD1d is the sole member of group 2. In the mouse, there are two CD1d molecules, CD1d1 and CD1d2. Although the group 1 CD1 molecules can present Ags to a wide variety of T cells, CD1d molecules present their Ags mostly to a unique T cell subpopulation called NKT cells. The majority of these T cells are called canonical or invariant NKT (iNKT3 cells) with a specific TCR α-chain rearrangement (Vα14-Jα18 in mice; Vα24-Jα18 in humans), associated with Vβ chains of limited diversity. NKT cells are capable of producing both Th1 and Th2 cytokines rapidly upon activation, suggesting that they have important immunoregulatory functions. This subject has been reviewed recently (7), so I will not discuss it further here. Both group 1 and group 2 CD1 molecules can present lipids (and perhaps other molecules) to the immune system (8), with those presented by CD1a, b, and c more extensively studied to date (with CD1d catching up very rapidly). Thus, the objective of this review is to discuss what is known about those molecules presented by CD1d and what (if any) activity the presentation of these ligands by CD1d in various disease states has been demonstrated. Some of these CD1d-presented ligands can activate T cells (good), some are inhibitory (bad), and some are not lipids (ugly?). In 1997, the first report suggesting that CD1d could present Ag demonstrated that a hydrophobic peptide called p99 could bind to murine CD1d1 and stimulate CD8+ T cells generated against the CD1d1/p99 complex (9). Interestingly, 2 years later, the crystal structure of CD1d1 was solved, and it indeed possessed a highly hydrophobic Ag binding groove (10). However, in 1998, we (Sebastian Joyce, Robert Cotter, Amina Woods, Jonathan Yewdell, Jack Bennink, and I) extracted a natural ligand from CD1d1 (11). Rather than a peptide (which is frankly what we had anticipated we would find), we detected GPI as a major natural ligand (Fig. 1⇓). We went on to show that phosphatidylinositol (PI) is also bound (12). Similarly, it was found that PI is a ligand naturally bound to human CD1d as well (13). More recently, CD1d1 was found to have phosphatidylcholine (PC) bound in a crystal structure derived from CD1d1 secreted from Drosophila cells (14). Thus, glyco- and phospholipids are natural ligands bound to CD1d molecules. What is their purpose in the grand scheme of CD1d-mediated Ag presentation? Although these molecules can bind to CD1d, they can only in rare circumstances stimulate canonical NKT cells (15). We suspected that the role they play is analogous to the function played by the invariant chain-derived CLIP peptide for MHC class II-mediated Ag presentation. Thus, the natural, endogenous glyco- and phospholipids reside in the CD1d Ag binding groove until in the correct (presumably late endocytic) compartment, where these ligands are replaced by a (glyco)lipid that, when presented on the cell surface by CD1d, stimulate NKT cells (16, 17, 18). For MHC class II molecules, the exchange of CLIP for an antigenic peptide in the MIIC compartment requires an acidic pH environment (19). Similarly, we found that inhibiting such acidification in these compartments substantially impairs CD1d-mediated Ag presentation (16). In line with our observations, Luc Teyton and Albert Bendelac, and Peter Cresswell independently showed direct evidence for such an exchange of an endogenous CD1d ligand mediated by a family of lipid transfer proteins termed saposins (20, 21). 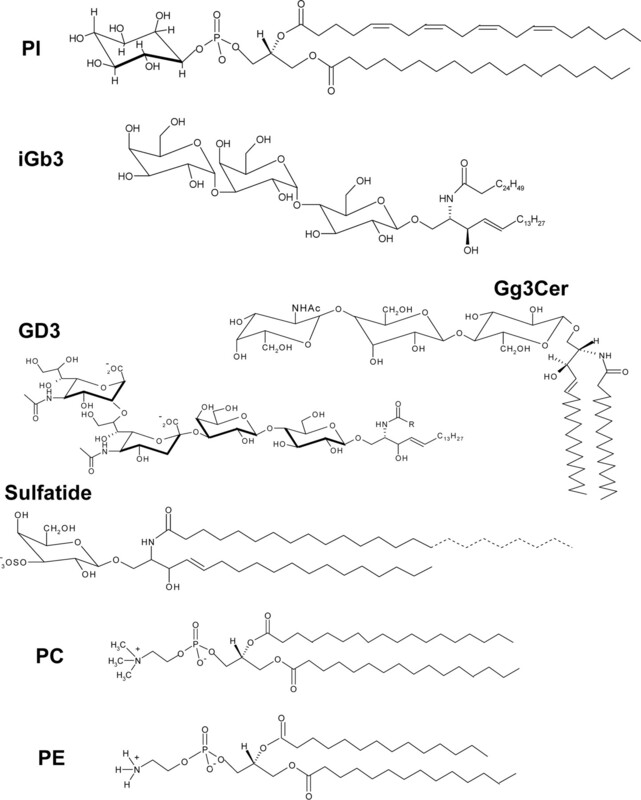 Soon after these reports, the Bendelac laboratory found that isoglobotrihexosylceramide (iGb3), a lysosomal glycosphingolipid, is a natural CD1d-presented ligand that can stimulate NKT cells (22). In mice deficient in the enzyme β-hexosaminidase b, important for iGb3 generation, NKT cell development is impaired substantially (22). In contrast to that which occurs with iNKT cells, some noncanonical NKT cells appear to be able to recognize lipids that are potentially loaded onto CD1d in the endoplasmic reticulum (20, 21, 23, 24, 25, 26). “Natural” ligands of CD1d. An array of lipids derived from mammalian cells that can bind to CD1d and stimulate or inhibit (or not activate) CD1d-restricted T cells. Gg3Cer, gangliotriaosylceramide; PE, phosphatidylethanolamine. Some natural cellular lipids can bind to CD1d and stimulate NKT cells or other CD1d-restricted T cells; several of these have effects in various disease states. For example, the natural lipid sulfatide found in myelin is presented by the group 1 CD1 molecules CD1a, b, and c (27, 28). This has important relevance in multiple sclerosis, as autoimmune responses to myelin occur in these patients, and such responses are believed to contribute to disease pathogenesis. In a mouse model, it has been shown that sulfatide can be presented by CD1d to T cells other than NKT cells, as determined by the use of sulfatide-loaded CD1d1 tetramers (29). Furthermore, and most importantly, treatment of wild-type (but not CD1d-deficient) mice with sulfatide prevented the development of experimental allergic encephalomyelitis (EAE) in that study. The recent solving of the crystal structure of CD1d1 complexed with sulfatide (30) will be helpful in understanding how this lipid is presented to CD1d-restricted, sulfatide-specific T cells. Two natural lipid components of the cell membrane, the disialoganglioside GD3 and PI, have been shown to be CD1d-presented Ags capable of stimulating (at least some) NKT cells. In the case of GD3 derived from the melanoma line SK-MEL-28, it appears as though it can be cross-presented by murine APCs to NKT cells (31). Furthermore, injection of GD3 into wild-type (but not CD1d-deficient) mice resulted in an increased number of NKT cells in the spleen, and these were detectable using GD3-loaded CD1d1 dimers. In the case of PI, one NKT cell hybridoma out of a panel of nine expressing an invariant TCR α-chain (Vα14Jα18) was strongly stimulated by soybean-derived PI when added to plate-bound purified CD1d1 (15). This NKT cell hybridoma called 24.8.A (and none of the others) was also stimulated to various degrees by phosphatidylethanolamine, phosphatidic acid, phosphatidylserine, phosphatidylinositol, PC, and monogalactosyl diglyceride. Furthermore, 24.8.A was able to recognize cd1d1 cDNA-transfected murine P815 (mastocytoma), EL-4, RMA/S (both T cells), and A20 (B cell) tumor cell lines (15). Of note, this group went on to show that changes in the degree of unsaturation of the phosphatidylethanolamine (the CD1d-presented Ag best able to stimulate 24.8.A) acyl chain affected its recognition by the NKT cell hybridoma. This is consistent with acyl chain structure playing an important role in phospholipid Ag presentation by CD1d (32). Interestingly, the 24.8.A NKT cell hybridoma could also “see” purified CD1d1 without added ligand. However, with a recent report showing that the crystal structure of Drosophila cell-expressed CD1d1 contains PC as a natural ligand (14), perhaps CD1d is never really “empty,” and this result may have been predictable in hindsight. Regardless of the very wide range of Ags recognized by this particular NKT cell hybridoma, it is nonetheless an interesting example of CD1d-presented ligands and their ability to be recognized by components of the innate immune response. Lipids binding to CD1d can also have inhibitory functions. As a case in point, the murine T cell lymphoma line L5178Y-R sheds glycolipids, with gangliotriaosylceramide being predominant (33, 34). We found that gangliotriaosylceramide inhibited CD1d-mediated Ag presentation to NKT cells (35), suggesting one means by which a tumor can evade an important component of the innate antitumor immune response. In 1997, a group led by Masaru Taniguchi found that α-GalCer, a glycolipid extracted from the marine sponge Agelas mauritianus (36), could stimulate NKT cells to rapidly produce both Th1 and Th2 cytokines in a CD1d-dependent manner (7, 37). α-GalCer has an α-anomeric sugar attached to acyl and sphingosine chains (Fig. 2⇓). α-GalCer-mediated stimulation of NKT cells interestingly results in an internalization of the TCR (38, 39, 40), originally thought to be a “loss” (41, 42, 43, 44, 45, 46). The Kawano et al. (37) study opened a floodgate of reports showing that α-GalCer could be effective as an antitumor immunopotentiator in a wide range of tumor model systems (reviewed in Ref. 47), as well as in other disease states. For example, in the murine B16 melanoma, or those tumors induced by methylcholanthrene, the administration of α-GalCer to tumor-bearing mice had profound in vivo effects by inhibiting metastatic disease, as well as the elimination of the primary tumor. Analysis of the antitumor efficacy of α-GalCer, coupled with the site-directed mutagenesis of the murine CD1d1 molecule (48), helped increase our understanding of how α-GalCer bound to CD1d and also provided clues regarding the mechanisms behind NKT cell activation by this glycolipid. α-GalCer was also shown to inhibit or ameliorate autoimmune diseases including diabetes and EAE (reviewed in Ref. 49). As mentioned above, the activation of NKT cells by α-GalCer induces both Th1 and Th2 cytokines (7). Thus, the idea behind the use of α-GalCer in autoimmune diseases was on the Th2 cytokine side. However, although multiple injections of α-GalCer seem to bias the response toward the production of Th2 cytokines (49), it appears as though the polarization of NKT cells (i.e., Th1 vs Th2) is either incomplete or ineffective (50). Interestingly, work by the Yamamura laboratory tried the approach of an α-GalCer analog in assessing the effect of NKT cell activation on EAE (51). In this study, the investigators truncated the sphingosine chain essentially in half, generating a molecule called OCH with a truncated sphingosine chain (OCH). It was found that OCH was substantially greater in its ability to treat and/or prevent the development of EAE than the parental α-GalCer. This effect correlated with a higher level of IL-4 production induced by administration of OCH than with α-GalCer (51). Other analogs of α-GalCer have been shown to have various effects on NKT cell activation in vitro, as well as antimicrobial and antitumor activity in vivo. For example, modifying the acyl chain of the α-GalCer molecule KRN 7000 to create a diunsaturated 20 carbon chain results in IL-4 production with a reduction in IFN-γ secretion (52). The requirements for the binding of this α-GalCer analog were less stringent as well, illustrating how changes in this chain can also have profound effects on NKT cell activation. In contrast to the effects of acyl chain modification on α-GalCer activity, Tsuji and colleagues (53, 54, 55, 56, 57) used a different approach. In their studies, they used a C-glycosidic form of α-GalCer in analyses of the adjuvant properties of α-GalCer. It was found that the C-glycoside induced more of a Th1 (i.e., IFN-γ) response, was longer lasting, and was actually a better adjuvant than the parental compound itself in murine models of malaria and metastatic melanoma (53, 54, 55, 56, 57). Furthermore, α-GalCer administration has been shown to be mostly protective activity against viruses (58, 59, 60, 61), bacteria (62, 63, 64, 65, 66, 67), and other pathogens (68, 69). In Trypanosoma cruzi, although GPIs and other lipids from this genus can bind to CD1d, those ligands do not stimulate NKT cells (70). However, although treatment of mice with α-GalCer is protective against infection with T. cruzi (71), it actually impairs the immune response against a DNA vaccine specific for this pathogen (72). α-GalCer and α-GalCer analogs. 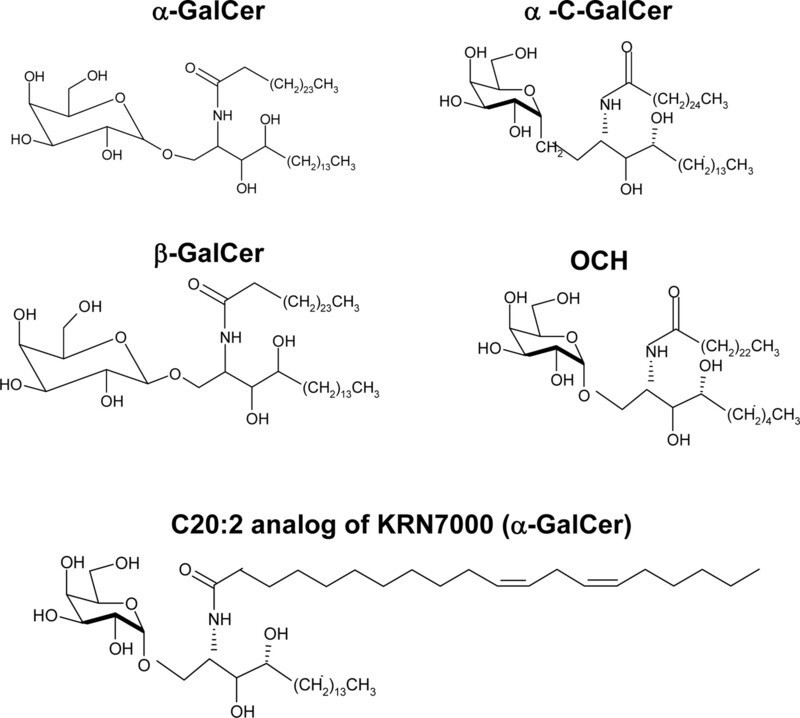 Synthetic α-GalCer and α-GalCer-based glycolipids used in studies described in this review. Ortaldo and colleagues (73), as well as Parekh et al. (74), have found that a 12 carbon acyl chain form of galactosylceramide ((β-GalCer (C12)) can stimulate NKT cells in a CD1d-dependent manner. It has been shown previously that the activation of NKT cells by α-GalCer results in concomitant NK cell stimulation (75, 76). The administration of the β-GalCer (C12) in vivo caused the apparent loss of NKT cells as found with α-GalCer (73), but without cytokine expression or activation of NK cells. Tetramers loaded with β-GalCer (C12) could stain NKT cells, although lower numbers were detected as compared with when α-GalCer-loaded tetramers are used (38, 39, 40, 73). However, some contamination with minute amounts of α-GalCer cannot be completely ruled out in either of the β-GalCer preparations (73, 74). In another study, the s.c. administration of β-GalCer (but not α-GalCer) to wild-type C57BL/6 mice resulted in a large number of NKT cells infiltrating the site of injection, similar to the CD1d-independent granulomas induced by the s.c. injection of mycobacterial PI dimannoside (77). Thus, β-GalCer may have some similar yet distinctly different actions on NKT cells. Two other sources of microbial products have been shown to be able to activate NKT cells. The Bonneville and Schaible groups reported that PI mannoside (PIM) could stimulate both human and murine NKT cells (82). Additionally, PIM-loaded CD1d tetramers could stain both human (PBL) and mouse (liver) NKT cells, although the latter detected a substantially smaller population than CD1d tetramers loaded with α-GalCer (∼0.3 vs 32%, respectively). Despite this interesting observation clearly identifying PIM as a CD1d ligand, how PIM actually participates in the immune response against mycobacteria is not yet clear, as it has been shown that CD1d-deficient mice do not significantly differ in survival from wild-type mice when infected with M. tuberculosis (83), whereas Jα18 (NKT cell)-deficient mice appear to be more susceptible (84). In the context of a Leishmania infection, it was found that lipophosphoglycan (present on the surface of this organism) and related glycoinositol phospholipids could bind to CD1d and stimulate IFN-γ production in a CD1d-dependent manner (85). In that study, a defective granulomatous response in CD1d-deficient mice infected with L. donovani was observed, with a concomitant elevation in parasite burden relative to wild-type mice. It was mentioned above that the α-GalCer analog OCH has been used in autoimmune disease models and that its efficacy in these models is dependent on a Th2 cytokine “bias” by NKT cells (51). The predominant NKT cells that are activated by α-GalCer, GSL-1, and other microbial glycolipids are the iNKT cells. Certainly, there could be other CD1d-restricted T cells that recognize CD1d presenting something other than these ligands, as is the case for sulfatide, for example (29). In fact, work from the Moody laboratory has shown that human noninvariant T cells that are CD1d-restricted can be activated by ligands that are neither peptides nor lipids. They found that phenyl pentamethyldihydrobenzofuran sulfonates (PPBFs; Fig. 3⇓) could stimulate a clonotypic population of human T cells (Vα2/Vβ21 TCR) that were very sensitive to changes in the hydroxylation and methylation patterns at the terminal ends of these molecules (86). Interestingly, PPBFs did not stimulate NKT cells, nor did α-GalCer stimulate the PPBF-reactive T cells. The structural relationship of PPBFs with sulfa drugs capable of inducing hypersensitivity reactions in humans may suggest that some of these responses are CD1d mediated and that the range of ligands capable of being presented by CD1d is not limited. Pathogen-derived and “other” CD1d ligands. CD1d ligands from Sphingomonas spp., Leishmania donovani, and Mycobacterium tuberculosis, as well as synthetic PPBF, capable of stimulating various CD1d-restricted T cell subpopulations. LPG, lipophosphoglycan from L. donovani; PIM4, PIM from M. tuberculosis. The number of carbons in the chains indicated as “R” is presented in the illustration next to the respective structures. The chicken OVA molecule has been used for analyzing Ag processing and presentation through “classical” MHC class I and II molecules. In the context of CD1d, it has been shown that CTL can be induced in response to OVA in an MHC-unrestricted manner, and their cytolytic activity can be inhibited by Abs to CD1d (87). Interestingly, it has recently been shown that PC and phosphatidylethanolamine from plant pollen can stimulate human CD1d- (and CD1a)-specific T cells (88). The T cells that responded to PC or phosphatidylethanolamine were rather diverse and only rarely included iNKT cells. Of intriguing note, T cell responses to these pollen phospholipids were mainly observed in allergic patients during pollen season, whereas normal (nonallergic) subjects rarely displayed such reactivity. This could also be related (at least to a limited degree) to recent work by Umetsu and his colleagues (89) in asthma patients. It is clear the ligands capable of being presented by CD1d molecules to T cells go well beyond α-GalCer and related compounds. Besides its application as a parental compound, α-GalCer has quite useful as a “backbone” or “foundation,” as illustrated by the enhanced efficacy of OCH in EAE, and increase in adjuvant activity when α-GalCer is introduced as its C-glycosidic form in malaria and tumor model systems. α-GalCer, either as a free compound, or pulsed on dendritic cells, has been given to patients with various forms of cancer in phase I trials (90, 91, 92, 93, 94). Although none have reported clinical responses, increased NKT cell activation and cytokine production was evident, suggesting that the potential for antitumor efficacy is there in more refined future studies. CD1d ligands completely unrelated to α-GalCer have been identified (and perhaps more of them are to be discovered), as well as the T cell subpopulation(s) stimulated by them. This opens up additional avenues for investigations aimed at understanding other diseases at a more basic level, in addition to the translation of those results to the clinic, where patients present with symptoms of unknown etiology. As a case in point, it has been shown recently by Umetsu and colleagues (89) that the majority of CD4+ T cells in the lungs of patients with moderate to severe asthma are, in fact, iNKT cells. Thus, it is conceivable that natural glycolipid Ags such as iGb3 (22), or bacterially-derived glycolipids such as GSL-1 (78, 79, 80, 81), could cause the enhanced number of pulmonary NKT cells in this disease. Certainly, then, the CD1d pathway of Ag presentation has the promise of utility in a number of different disorders or conditions, and for which we might be able to exploit their CD1d dependence for novel treatments or preventative strategies. I thank Manjula Nagala, Gourapura Renukaradhya, and Masood Khan for help with the CD1d ligand structures and comments on the manuscript. ↵1 This work was supported in part by National Institutes of Health Grants AI46455, CA89026, and AI056097, as well as support from the Walther Cancer Institute. R.R.B. is a Scholar of the Leukemia and Lymphoma Society. ↵3 Abbreviations used in this paper: iNKT, invariant NKT; PI, phosphatidylinositol; PC, phosphatidylcholine; iGb3, isoglobotrihexosylceramide; EAE, experimental allergic encephalomyelitis; α-GalCer, α-galactosylceramide; β-GalCer, β-galactosylceramide; OCH, α-GalCer with a truncated sphingosine chain; GSL-1, α-glucuronosylceramide; PIM, phosphatidylinositol mannoside; PPBF, phenyl pentamethyldihydrobenzofuransulfonate. Pamer, E., P. Cresswell. 1998. Mechanisms of MHC class I–restricted antigen processing. Annu. Rev. Immunol. 16: 323-358. Simister, N. E., K. E. Mostov. 1989. An Fc receptor structurally related to MHC class I antigens. Nature 337: 184-187. Simister, N. E., K. E. Mostov. 1989. Cloning and expression of the neonatal rat intestinal Fc receptor, a major histocompatibility complex class I antigen homolog. Cold Spring Harb. Symp. Quant Biol. 54: 571-580. Zhu, X., G. Meng, B. L. Dickinson, X. Li, E. Mizoguchi, L. Miao, Y. Wang, C. Robert, B. Wu, P. D. Smith, et al 2001. MHC class I-related neonatal Fc receptor for IgG is functionally expressed in monocytes, intestinal macrophages, and dendritic cells. J. Immunol. 166: 3266-3276. Enns, C. A.. 2001. Pumping iron: the strange partnership of the hemochromatosis protein, a class I MHC homolog, with the transferrin receptor. Traffic 2: 167-174. Porcelli, S. A.. 1995. The CD1 family: a third lineage of antigen-presenting molecules. Adv. Immunol. 59: 1-98. Kronenberg, M.. 2005. Toward an understanding of NKT cell biology: progress and paradoxes. Annu. Rev. Immunol. 23: 877-900. Moody, D. B., D. M. Zajonc, I. A. Wilson. 2005. Anatomy of CD1-lipid antigen complexes. Nat. Rev. Immunol. 5: 387-399. Castano, A. R., S. Tangri, J. E. W. Miller, H. R. Holcombe, M. R. Jackson, W. D. Huse, M. Kronenberg, P. A. Peterson. 1995. Peptide binding and presentation by mouse CD1. Science 269: 223-226. Zeng, Z., A. R. Castano, B. W. Segelke, E. A. Stura, P. A. Peterson, I. A. Wilson. 1997. Crystal structure of mouse CD1: an MHC-like fold with a large hydrophobic binding groove. Science 277: 339-345. Joyce, S., A. S. Woods, J. W. Yewdell, J. R. Bennink, A. D. De Silva, A. Boesteanu, S. P. Balk, R. J. Cotter, R. R. Brutkiewicz. 1998. Natural ligand of mouse CD1d1: cellular glycosylphosphatidylinositol. Science 279: 1541-1544. De Silva, A. D., J. J. Park, N. Matsuki, A. K. Stanic, R. R. Brutkiewicz, M. E. Medof, S. Joyce. 2002. Lipid protein interactions: the assembly of CD1d1 with cellular phospholipids occurs in the endoplasmic reticulum. J. Immunol. 168: 723-733. Park, J. J., S. J. Kang, A. D. De Silva, A. K. Stanic, G. Casorati, D. L. Hachey, P. Cresswell, S. Joyce. 2004. Lipid-protein interactions: biosynthetic assembly of CD1 with lipids in the endoplasmic reticulum is evolutionarily conserved. Proc. Natl. Acad. Sci. USA 101: 1022-1026. Giabbai, B., S. Sidobre, M. D. Crispin, Y. Sanchez-Ruiz, A. Bachi, M. Kronenberg, I. A. Wilson, M. Degano. 2005. Crystal structure of mouse CD1d bound to the self ligand phosphatidylcholine: a molecular basis for NKT cell activation. J. Immunol. 175: 977-984. Gumperz, J. E., C. Roy, A. Makowska, D. Lum, M. Sugita, T. Podrebarac, Y. Koezuka, S. A. Porcelli, S. Cardell, M. B. Brenner, S. M. Behar. 2000. Murine CD1d-restricted T cell recognition of cellular lipids. Immunity 12: 211-221. Roberts, T. J., V. Sriram, P. M. Spence, M. Gui, K. Hayakawa, I. Bacik, J. R. Bennink, J. W. Yewdell, R. R. Brutkiewicz. 2002. Recycling CD1d1 molecules present endogenous antigens processed in an endocytic compartment to NKT cells. J. Immunol. 168: 5409-5414. Porcelli, S. A., R. L. Modlin. 1999. The CD1 System: antigen-presenting molecules for T cell recognition of lipids and glycolipids. Annu. Rev. Immunol. 17: 297-329. Jayawardena-Wolf, J., A. Bendelac. 2001. CD1 and lipid antigens: intracellular pathways for antigen presentation. Curr. Opin. Immunol. 13: 109-113. Watts, C.. 1997. Capture and processing of exogenous antigens for presentation on MHC molecules. Annu. Rev. Immunol. 15: 821-850. Kang, S. J., P. Cresswell. 2004. Saposins facilitate CD1d-restricted presentation of an exogenous lipid antigen to T cells. Nat. Immunol. 5: 175-181. Zhou, D., C. Cantu, III, Y. Sagiv, N. Schrantz, A. B. Kulkarni, X. Qi, D. J. Mahuran, C. R. Morales, G. A. Grabowski, K. Benlagha, et al 2004. Editing of CD1d-bound lipid antigens by endosomal lipid transfer proteins. Science 303: 523-527. Zhou, D., J. Mattner, C. Cantu, III, N. Schrantz, N. Yin, Y. Gao, Y. Sagiv, K. Hudspeth, Y. P. Wu, T. Yamashita, et al 2004. Lysosomal glycosphingolipid recognition by NKT cells. Science 306: 1786-1789. Brossay, L., S. Tangri, M. Bix, S. Cardell, R. Locksley, M. Kronenberg. 1998. Mouse CD1-autoreactive T cells have diverse patterns of reactivity to CD1+ targets. J. Immunol. 160: 3681-3688. Chiu, Y. H., J. Jayawardena, A. Weiss, D. Lee, S. H. Park, A. Dautry-Varsat, A. Bendelac. 1999. Distinct subsets of CD1d-restricted T cells recognize self-antigens loaded in different cellular compartments. J. Exp. Med. 189: 103-110. Jayawardena-Wolf, J., K. Benlagha, Y. H. Chiu, R. Mehr, A. Bendelac. 2001. CD1d endosomal trafficking is independently regulated by an intrinsic CD1d-encoded tyrosine motif and by the invariant chain. Immunity 15: 897-908. Roberts, T. J., Y. Lin, P. M. Spence, L. Van Kaer, R. R. Brutkiewicz. 2004. CD1d1-dependent control of the magnitude of an acute antiviral immune response. J. Immunol. 172: 3454-3461. Shamshiev, A., A. Donda, I. Carena, L. Mori, L. Kappos, G. De Libero. 1999. Self glycolipids as T cell autoantigens. Eur. J. Immunol. 29: 1667-1675. Shamshiev, A., H. J. Gober, A. Donda, Z. Mazorra, L. Mori, G. De Libero. 2002. Presentation of the same glycolipid by different CD1 molecules. J. Exp. Med. 195: 1013-1021. Jahng, A., I. Maricic, C. Aguilera, S. Cardell, R. C. Halder, V. Kumar. 2004. Prevention of autoimmunity by targeting a distinct, noninvariant CD1d-reactive T cell population reactive to sulfatide. J. Exp. Med. 199: 947-957. Zajonc, D. M., I. Maricic, D. Wu, R. Halder, K. Roy, C. H. Wong, V. Kumar, I. A. Wilson. 2005. Structural basis for CD1d presentation of a sulfatide derived from myelin and its implications for autoimmunity. J. Exp. Med. 202: 1517-1526. Wu, D. Y., N. H. Segal, S. Sidobre, M. Kronenberg, P. B. Chapman. 2003. Cross-presentation of disialoganglioside GD3 to natural killer T cells. J. Exp. Med. 198: 173-181. Rauch, J., J. Gumperz, C. Robinson, M. Skold, C. Roy, D. C. Young, M. Lafleur, D. B. Moody, M. B. Brenner, C. E. Costello, S. M. Behar. 2003. Structural features of the acyl chain determine self-phospholipid antigen recognition by a CD1d-restricted invariant NKT (iNKT) cell. J. Biol. Chem. 278: 47508-47515. Young, W. W., Jr, Y. Tamura, H. S. Johnson, D. A. Miller. 1983. Decreased glycolipid antigen expression in lymphoma cell variants escaping from anti-glycolipid serotherapy. J. Exp. Med. 157: 24-33. Young, W. W., Jr, C. A. Borgman, D. M. Wolock. 1986. Modes of shedding of glycosphingolipids from mouse lymphoma cells. J. Biol. Chem. 261: 2279-2283. Sriram, V., S. Cho, P. Li, P. W. O’Donnell, C. Dunn, K. Hayakawa, J. S. Blum, R. R. Brutkiewicz. 2002. Inhibition of glycolipid shedding rescues recognition of a CD1+ T cell lymphoma by natural killer T (NKT) cells. Proc. Natl. Acad. Sci. USA 99: 8197-8202. Morita, M., K. Motoki, K. Akimoto, T. Natori, T. Sakai, E. Sawa, K. Yamaji, Y. Koezuka, E. Kobayashi, H. Fukushima. 1995. Structure-activity relationship of α-galactosylceramides against B16-bearing mice. J. Med. Chem. 38: 2176-2187. Kawano, T., J. Cui, Y. Koezuka, I. Toura, Y. Kaneko, K. Motoki, H. Ueno, R. Nakagawa, H. Sato, E. Kondo, et al 1997. CD1d-restricted and TCR-mediated activation of Vα14 NKT cells by glycosylceramides. Science 278: 1626-1629. Wilson, M. T., C. Johansson, D. Olivares-Villagomez, A. K. Singh, A. K. Stanic, C. R. Wang, S. Joyce, M. J. Wick, L. Van Kaer. 2003. The response of natural killer T cells to glycolipid antigens is characterized by surface receptor down-modulation and expansion. Proc. Natl. Acad. Sci. USA 100: 10913-10918. Crowe, N. Y., A. P. Uldrich, K. Kyparissoudis, K. J. Hammond, Y. Hayakawa, S. Sidobre, R. Keating, M. Kronenberg, M. J. Smyth, D. I. Godfrey. 2003. Glycolipid antigen drives rapid expansion and sustained cytokine production by NK T cells. J. Immunol. 171: 4020-4027. Harada, M., K. Seino, H. Wakao, S. Sakata, Y. Ishizuka, T. Ito, S. Kojo, T. Nakayama, M. Taniguchi. 2004. Down-regulation of the invariant Vα14 antigen receptor in NKT cells upon activation. Int. Immunol. 16: 241-247. Eberl, G., P. Brawand, H. R. MacDonald. 2000. Selective bystander proliferation of memory CD4+ and CD8+ T cells upon NK T or T cell activation. J. Immunol. 165: 4305-4311. Hayakawa, Y., K. Takeda, H. Yagita, S. Kakuta, Y. Iwakura, L. Van Kaer, I. Saiki, K. Okumura. 2001. Critical contribution of IFN-γand NK cells, but not perforin- mediated cytotoxicity, to anti-metastatic effect of α-galactosylceramide. Eur. J. Immunol. 31: 1720-1727. Leite-De-Moraes, M. C., A. Herbelin, C. Gouarin, Y. Koezuka, E. Schneider, M. Dy. 2000. Fas/Fas ligand interactions promote activation-induced cell death of NK T lymphocytes. J. Immunol. 165: 4367-4371. Matsuda, J. L., O. V. Naidenko, L. Gapin, T. Nakayama, M. Taniguchi, C. R. Wang, Y. Koezuka, M. Kronenberg. 2000. Tracking the response of natural killer T cells to a glycolipid antigen using CD1d tetramers. J. Exp. Med. 192: 741-754. Nakagawa, R., I. Nagafune, Y. Tazunoki, H. Ehara, H. Tomura, R. Iijima, K. Motoki, M. Kamishohara, S. Seki. 2001. Mechanisms of the antimetastatic effect in the liver and of the hepatocyte injury induced by α-galactosylceramide in mice. J. Immunol. 166: 6578-6584. Osman, Y., T. Kawamura, T. Naito, K. Takeda, L. Van Kaer, K. Okumura, T. Abo. 2000. Activation of hepatic NKT cells and subsequent liver injury following administration of α-galactosylceramide. Eur. J. Immunol. 30: 1919-1928. Brutkiewicz, R. R., V. Sriram. 2002. Natural killer T (NKT) cells and their role in antitumor immunity. Crit. Rev. Oncol. Hematol. 41: 287-298. Burdin, N., L. Brossay, M. Degano, H. Iijima, M. Gui, I. A. Wilson, M. Kronenberg. 2000. Structural requirements for antigen presentation by mouse CD1. Proc. Natl. Acad. Sci. USA 97: 10156-10161. Hammond, K. J., D. I. Godfrey. 2002. NKT cells: potential targets for autoimmune disease therapy?. Tissue Antigens 59: 353-363. Matsuda, J. L., L. Gapin, J. L. Baron, S. Sidobre, D. B. Stetson, M. Mohrs, R. M. Locksley, M. Kronenberg. 2003. Mouse Vα14i natural killer T cells are resistant to cytokine polarization in vivo. Proc. Natl. Acad. Sci. USA 100: 8395-8400. Miyamoto, K., S. Miyake, T. Yamamura. 2001. A synthetic glycolipid prevents autoimmune encephalomyelitis by inducing Th2 bias of natural killer T cells. Nature 413: 531-534. Yu, K. O., J. S. Im, A. Molano, Y. Dutronc, P. A. Illarionov, C. Forestier, N. Fujiwara, I. Arias, S. Miyake, T. Yamamura, et al 2005. Modulation of CD1d-restricted NKT cell responses by using N-acyl variants of α-galactosylceramides. Proc. Natl. Acad. Sci. USA 102: 3383-3388. Gonzalez-Aseguinolaza, G., C. de Oliveira, M. Tomaska, S. Hong, O. Bruna-Romero, T. Nakayama, M. Taniguchi, A. Bendelac, L. Van Kaer, Y. Koezuka, M. Tsuji. 2000. α-Galactosylceramide-activated Vα14 natural killer T cells mediate protection against murine malaria. Proc. Natl. Acad. Sci. USA 97: 8461-8466. Gonzalez-Aseguinolaza, G., L. Van Kaer, C. C. Bergmann, J. M. Wilson, J. Schmieg, M. Kronenberg, T. Nakayama, M. Taniguchi, Y. Koezuka, M. Tsuji. 2002. Natural killer T cell ligand α-galactosylceramide enhances protective immunity induced by malaria vaccines. J. Exp. Med. 195: 617-624. Schmieg, J., G. Yang, R. W. Franck, N. Van Rooijen, M. Tsuji. 2005. Glycolipid presentation to natural killer T cells differs in an organ-dependent fashion. Proc. Natl. Acad. Sci. USA 102: 1127-1132. Schmieg, J., G. Yang, R. W. Frank, M. Tsuji. 2003. Superior protection against malaria and melanoma metastases by a C-glycoside analogue of the natural killer T cell ligand α-galactosylceramide. J. Exp. Med. 198: 1631-1641. Yang, G., J. Schmieg, M. Tsuji, R. W. Franck. 2004. The C-glycoside analogue of the immunostimulant α-galactosylceramide (KRN7000): synthesis and striking enhancement of activity. Angew. Chem. Int. Ed. Engl. 43: 3818-3822. Exley, M. A., N. J. Bigley, O. Cheng, S. M. Tahir, S. T. Smiley, Q. L. Carter, H. F. Stills, M. J. Grusby, Y. Koezuka, M. Taniguchi, S. P. Balk. 2001. CD1d-reactive T cell activation leads to amelioration of disease caused by diabetogenic encephalomyocarditis virus. J. Leukocyte Biol. 69: 713-718. Kakimi, K., L. G. Guidotti, Y. Koezuka, F. V. Chisari. 2000. Natural killer T cell activation inhibits hepatitis B virus replication in vivo. J. Exp. Med. 192: 921-930. Ko, S. Y., H. J. Ko, W. S. Chang, S. H. Park, M. N. Kweon, C. Y. Kang. 2005. α-Galactosylceramide can act as a nasal vaccine adjuvant inducing protective immune responses against viral infection and tumor. J. Immunol. 175: 3309-3317. Van Dommelen, S. L., H. A. Tabarias, M. J. Smyth, M. A. Degli-Esposti. 2003. Activation of natural killer (NK) T cells during murine cytomegalovirus infection enhances the antiviral response mediated by NK cells. J. Virol. 77: 1877-1884. Bilenki, L., S. Wang, J. Yang, Y. Fan, A. G. Joyee, X. Yang. 2005. NK T cell activation promotes Chlamydia trachomatis infection in vivo. J. Immunol. 175: 3197-3206. Chackerian, A., J. Alt, V. Perera, S. M. Behar. 2002. Activation of NKT cells protects mice from tuberculosis. Infect. Immun. 70: 6302-6309. Gansert, J. L., V. Kiessler, M. Engele, F. Wittke, M. Rollinghoff, A. M. Krensky, S. A. Porcelli, R. L. Modlin, S. Stenger. 2003. Human NKT cells express granulysin and exhibit antimycobacterial activity. J. Immunol. 170: 3154-3161. Kawakami, K., N. Yamamoto, Y. Kinjo, K. Miyagi, C. Nakasone, K. Uezu, T. Kinjo, T. Nakayama, M. Taniguchi, A. Saito. 2003. Critical role of Vα14+ natural killer T cells in the innate phase of host protection against Streptococcus pneumoniae infection. Eur. J. Immunol. 33: 3322-3330. Minagawa, S., C. Ohyama, S. Hatakeyama, N. Tsuchiya, T. Kato, T. Habuchi. 2005. Activation of natural killer T cells by α-galactosylceramide mediates clearance of bacteria in murine urinary tract infection. J. Urol. 173: 2171-2174. Nieuwenhuis, E. E., T. Matsumoto, M. Exley, R. A. Schleipman, J. Glickman, D. T. Bailey, N. Corazza, S. P. Colgan, A. B. Onderdonk, R. S. Blumberg. 2002. CD1d-dependent macrophage-mediated clearance of Pseudomonas aeruginosa from lung. Nat. Med. 8: 588-593. Kawakami, K., Y. Kinjo, S. Yara, Y. Koguchi, K. Uezu, T. Nakayama, M. Taniguchi, A. Saito. 2001. Activation of Vα14+ natural killer T cells by α-galactosylceramide results in development of Th1 response and local host resistance in mice infected with Cryptococcus neoformans. Infect. Immun. 69: 213-220. Ronet, C., S. Darche, M. Leite de Moraes, S. Miyake, T. Yamamura, J. A. Louis, L. H. Kasper, D. Buzoni-Gatel. 2005. NKT cells are critical for the initiation of an inflammatory bowel response against Toxoplasma gondii. J. Immunol. 175: 899-908. Procopio, D. O., I. C. Almeida, A. C. Torrecilhas, J. E. Cardoso, L. Teyton, L. R. Travassos, A. Bendelac, R. T. Gazzinelli. 2002. Glycosylphosphatidylinositol-anchored mucin-like glycoproteins from Trypanosoma cruzi bind to CD1d but do not elicit dominant innate or adaptive immune responses via the CD1d/NKT cell pathway. J. Immunol. 169: 3926-3933. Duthie, M. S., S. J. Kahn. 2002. Treatment with α-galactosylceramide before Trypanosoma cruzi infection provides protection or induces failure to thrive. J. Immunol. 168: 5778-5785. Miyahira, Y., M. Katae, K. Takeda, H. Yagita, K. Okumura, S. Kobayashi, T. Takeuchi, T. Kamiyama, Y. Fukuchi, T. Aoki. 2003. Activation of natural killer T cells by α-galactosylceramide impairs DNA vaccine-induced protective immunity against Trypanosoma cruzi. Infect. Immun. 71: 1234-1241. Ortaldo, J. R., H. A. Young, R. T. Winkler-Pickett, E. W. Bere, Jr, W. J. Murphy, R. H. Wiltrout. 2004. Dissociation of NKT stimulation, cytokine induction, and NK activation in vivo by the use of distinct TCR-binding ceramides. J. Immunol. 172: 943-953. Parekh, V. V., A. K. Singh, M. T. Wilson, D. Olivares-Villagomez, J. S. Bezbradica, H. Inazawa, H. Ehara, T. Sakai, I. Serizawa, L. Wu, et al 2004. Quantitative and qualitative differences in the in vivo response of NKT cells to distinct α- and β-anomeric glycolipids. J. Immunol. 173: 3693-3706. Carnaud, C., D. Lee, O. Donnars, S. H. Park, A. Beavis, Y. Koezuka, A. Bendelac. 1999. Cutting edge: cross-talk between cells of the innate immune system: NKT cells rapidly activate NK cells. J. Immunol. 163: 4647-4650. Eberl, G., H. R. MacDonald. 2000. Selective induction of NK cell proliferation and cytotoxicity by activated NKT cells. Eur. J. Immunol. 30: 985-992. Mempel, M., C. Ronet, F. Suarez, M. Gilleron, G. Puzo, L. Van Kaer, A. Lehuen, P. Kourilsky, G. Gachelin. 2002. Natural killer T cells restricted by the monomorphic MHC class 1b CD1d1 molecules behave like inflammatory cells. J. Immunol. 168: 365-371. Kinjo, Y., D. Wu, G. Kim, G. W. Xing, M. A. Poles, D. D. Ho, M. Tsuji, K. Kawahara, C. H. Wong, M. Kronenberg. 2005. Recognition of bacterial glycosphingolipids by natural killer T cells. Nature 434: 520-525. Mattner, J., K. L. Debord, N. Ismail, R. D. Goff, C. Cantu, III, D. Zhou, P. Saint-Mezard, V. Wang, Y. Gao, N. Yin, et al 2005. Exogenous and endogenous glycolipid antigens activate NKT cells during microbial infections. Nature 434: 525-529. Sriram, V., W. Du, J. Gervay-Hague, R. R. Brutkiewicz. 2005. Cell wall glycosphingolipids of Sphingomonas paucimobilis are CD1d-specific ligands for NKT cells. Eur. J. Immunol. 35: 1692-1701. Wu, D., G. W. Xing, M. A. Poles, A. Horowitz, Y. Kinjo, B. Sullivan, V. Bodmer-Narkevitch, O. Plettenburg, M. Kronenberg, M. Tsuji, et al 2005. Bacterial glycolipids and analogs as antigens for CD1d-restricted NKT cells. Proc. Natl. Acad. Sci. USA 102: 1351-1356. Fischer, K., E. Scotet, M. Niemeyer, H. Koebernick, J. Zerrahn, S. Maillet, R. Hurwitz, M. Kursar, M. Bonneville, S. H. Kaufmann, U. E. Schaible. 2004. Mycobacterial phosphatidylinositol mannoside is a natural antigen for CD1d-restricted T cells. Proc. Natl. Acad. Sci. USA 101: 10685-10690. Behar, S. M., C. C. Dascher, M. J. Grusby, C. R. Wang, M. B. Brenner. 1999. Susceptibility of mice deficient in CD1D or TAP1 to infection with Mycobacterium tuberculosis. J. Exp. Med. 189: 1973-1980. Sugawara, I., H. Yamada, S. Mizuno, C. Y. Li, T. Nakayama, M. Taniguchi. 2002. Mycobacterial infection in natural killer T cell knockout mice. Tuberculosis 82: 97-104. Amprey, J. L., J. S. Im, S. J. Turco, H. W. Murray, P. A. Illarionov, G. S. Besra, S. A. Porcelli, G. F. Spath. 2004. A subset of liver NK T cells is activated during Leishmania donovani infection by CD1d-bound lipophosphoglycan. J. Exp. Med. 200: 895-904. Van Rhijn, I., D. C. Young, J. S. Im, S. B. Levery, P. A. Illarionov, G. S. Besra, S. A. Porcelli, J. Gumperz, T. Y. Cheng, D. B. Moody. 2004. CD1d-restricted T cell activation by nonlipidic small molecules. Proc. Natl. Acad. Sci. USA 101: 13578-13583. Lee, D. J., A. Abeyratne, D. A. Carson, M. Corr. 1998. Induction of an antigen-specific, CD1-restricted cytotoxic T lymphocyte response in vivo. J. Exp. Med. 187: 433-438. Agea, E., A. Russano, O. Bistoni, R. Mannucci, I. Nicoletti, L. Corazzi, A. D. Postle, G. De Libero, S. A. Porcelli, F. Spinozzi. 2005. Human CD1-restricted T cell recognition of lipids from pollens. J. Exp. Med. 202: 295-308. Akbari, O., J. L. Faul, E. G. Hoyte, G. J. Berry, J. Wahlstrom, M. Kronenberg, R. H. DeKruyff, D. T. Umetsu. 2006. CD4+ invariant T cell receptor+ natural killer T cells in bronchial asthma. N. Engl. J. Med. 354: 1117-1129. Chang, D. H., K. Osman, J. Connolly, A. Kukreja, J. Krasovsky, M. Pack, A. Hutchinson, M. Geller, N. Liu, R. Annable, et al 2005. Sustained expansion of NKT cells and antigen-specific T cells after injection of α-galactosyl-ceramide loaded mature dendritic cells in cancer patients. J. Exp. Med. 201: 1503-1517. Giaccone, G., C. J. Punt, Y. Ando, R. Ruijter, N. Nishi, M. Peters, B. M. Von Blomberg, R. J. Scheper, H. J. Van Der Vliet, A. J. Van Den Eertwegh, et al 2002. A phase I study of the natural killer T cell ligand α-galactosylceramide (KRN7000) in patients with solid tumors. Clin. Cancer Res. 8: 3702-3709. Ishikawa, A., S. Motohashi, E. Ishikawa, H. Fuchida, K. Higashino, M. Otsuji, T. Iizasa, T. Nakayama, M. Taniguchi, T. Fujisawa. 2005. A phase I study of α-galactosylceramide (KRN7000)-pulsed dendritic cells in patients with advanced and recurrent non-small cell lung cancer. Clin. Cancer Res. 11: 1910-1917. Nieda, M., M. Okai, A. Tazbirkova, H. Lin, A. Yamaura, K. Ide, R. Abraham, T. Juji, D. J. Macfarlane, A. J. Nicol. 2004. Therapeutic activation of Vα24+Vβ11+ NKT cells in human subjects results in highly coordinated secondary activation of acquired and innate immunity. Blood 103: 383-389. Okai, M., M. Nieda, A. Tazbirkova, D. Horley, A. Kikuchi, S. Durrant, T. Takahashi, A. Boyd, R. Abraham, H. Yagita, et al 2002. Human peripheral blood Vα24+Vβ11+ NKT cells expand following administration of α-galactosylceramide-pulsed dendritic cells. Vox Sang. 83: 250-253.